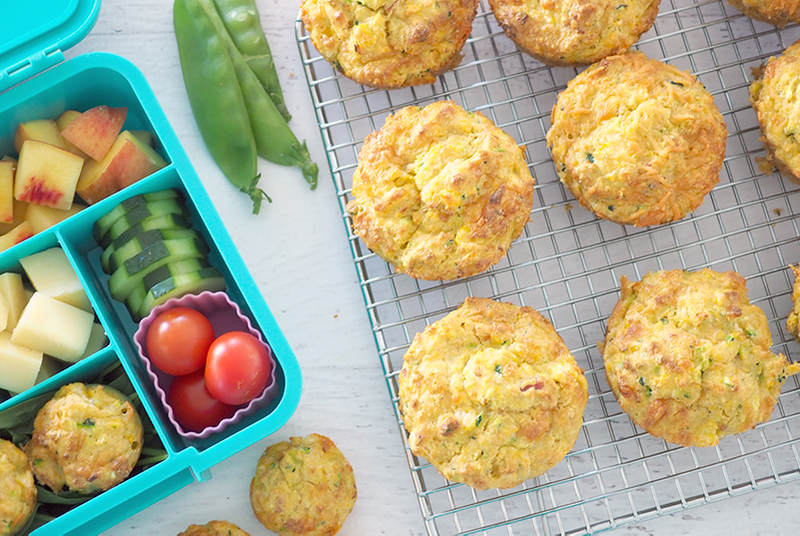 Move over boring Vegemite sandwiches, and hello Cheesy Bacon and Vegetable Muffins! These babies are packed with veggies, and are a great ready-to-go sandwich substitute that you can keep in the freezer, and pop into the kid’s lunchboxes on those busy school mornings. This recipe really is as easy as combining the ingredients, spooning the mixture into a muffin tray, and putting them into the oven. They make a great after school snack for the kids too! 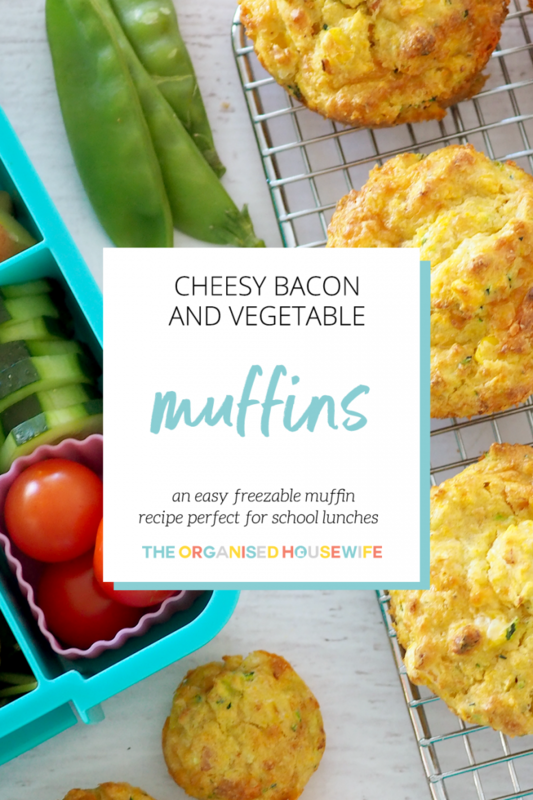 I like to make a batch of these Cheesy Bacon and Vegetable Muffins at the same time as I bake a couple of other recipes from my Lunch Box Recipes Cookbook (which are all freezable!). It’s a really quick and easy way for me to get a good stockpile of lunch box fillers into my freezer, and it means my kids and hubby don’t get bored with the same thing day after day. A big bake up like this can last me weeks, save me a fortune, and make my mornings run so much smoother. Preheat oven to 180°C and grease a 12 hole regular muffin tin. In a large bowl add flour, milk, butter and eggs, whisk until combined. 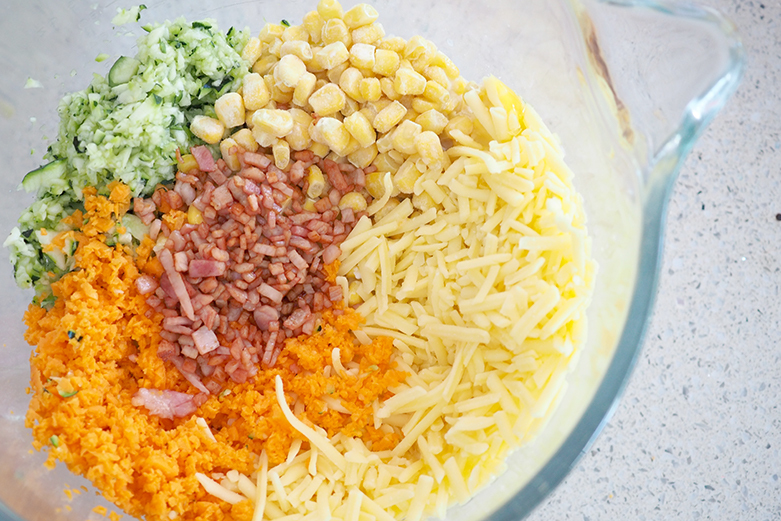 Add carrot, zucchini, corn, bacon and cheese. Spoon mixture evenly into prepared muffin tin. Bake muffins for a further 15-18 minutes or until golden and cooked through. To make school lunches even more fuss-free, I’d recommend using my Lunch Box Planner Pad in addition to the Lunch Box Recipes Cookbook. This way you can make sure you have everything you need before the week kicks off, and save yourself from those annoying (and expensive!) mid-week supermarket trips. I have bundled these items together in a savings pack for you. LET ME KNOW WHAT YOU THINK OF THIS RECIPE! – If you’ve tried this Cheesy Bacon and Vegetable Muffin recipe, please leave me a comment below. I love to hear from people who’ve made my recipes! You can SUBSCRIBE to receive my newsletters with the latest recipes or FOLLOW ME on FACEBOOK, INSTAGRAM and PINTEREST for even more delicious food. I’ve always pre-cooked the bacon before adding to muffin mixes. Is this not necessary? I’ve also substituted a good quality, double smoked ham (or prosciutto) for the bacon when in a rush. Great recipe, thanks!